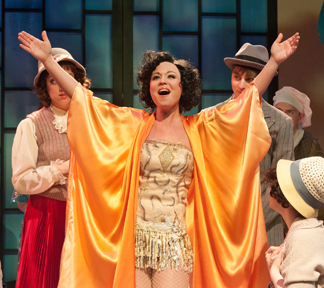 SpeakEasy Stage Company is ending its season with a fun musical romp. That last cliche is one I rarely use, but it's totally on target here with "The Drowsy Chaperone," which is aptly described as "a musical within a comedy". Music and lyrics are by Lisa Lambert and Greg Morrison. The book is by Bob Martin and Don McKellar. The premise is rather clever. A lonely guy called Man In Chair (Will McGarrahan, at left) is at home, sitting in his favorite chair, wrapped in his favorite cardigan sweater. He speaks directly to the audience, telling us about his favorite Broadway musical -- an old chestnut called "The Drowsy Chaperone." Sharing minutia about the show as only a theater buff can, he puts the record (that's right) on the record player (yes, again) and the entire show bursts to life, right there in his cramped New York City apartment. The plot of the show within a show is typical of a musical from the 20's. In many respects it's corny, implausible and filled with unlikely happenings. All of which Man In Chair relishes -- sometimes celebrating these points, sometimes slamming them and occasionally taking the needle off the record and stopping the show in its tracks to dish on the personalities, histories and whispered indiscretions of the actors performing on the recording. The fact that the entire thing is so self-referential makes it all that much funnier. None of it is to be taken seriously, which is the real fun of the show. The jokes are fast and furious, brimming with irony and tons of inside humor. Do you have to be a musical theater expert to get it? Not at all. But if you know a thing or two, you'll really appreciate how sharp the writing and the performances are. This is a real ensemble cast, all of them swirling around Will McGarrahan as Man In Chair. In McGarrahan, you've got one of the best comic actors in town delivering lines that are perfectly crafted for his devilishly seasoned touch. Two of Boston's true legends -- Karen MacDonald and Thomas Derrah (at left) -- are featured as the boozy Chaperone and Aldolpho, "the man of a thousand accents -- all of them insulting." Both of them chew the scenery with delight, teaming up for the duet "I Am Aldolpho." MacDonald also gets to deliver the overdone "inspirational" anthem, "As We Stumble Along." With MacDonald usually seen in wonderful but heavily dramatic roles, it's great fun to see her perfect something so silly. McCaela Donovan (no relation) once again shows her range with a delightful turn as Janet, the retiring star who says she no longer wants to "Show Off," but does so again and again (and again). With a gorgeous voice and a comical but dead serious Betty Boop stance, she gets to sing the perfectly awful "I Put A Monkey On A Pedestal." 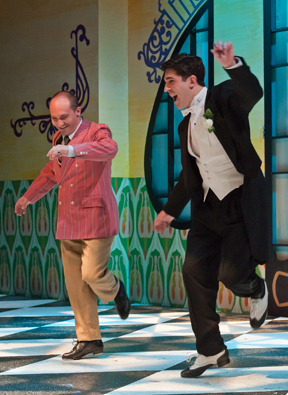 As Robert, the hapless groom, David Christensen (at left) is cheerfully brainless, whether roller skating while blindfolded ("An Accident Waiting To Happen") or contemplating the decision of marriage ("Cold Feets"). Brian Swasey (far left) is great as George the Best Man, showing off his considerable tap dancing skills. Kerry Dowling is Mrs. Tottendale, an appropriately named dotty dowager who's hosting the wedding but never seems to remember there's a wedding at all. Her long suffering man servant, coolly played by Robert Saoud, is appropriately named Underling. Again, you've got two Boston pros pairing up for foolishness that ranges from groaning humor to slapstick spit-takes. J. T. Turner is Feldzieg the producer (Feldzieg, Ziegfeld, get it?) quaking in his boots. Sarah Drake is the producer's bubble brained chorine-girlfriend who wants a bigger share of the spotlight. Nellanna is Trix the Aviatrix who swoops in to save the day. And Ryan Halsaver and Joe Langthorne are comically threatening as the pun-spewing, faux-pastry chefs. As far as the staging goes, I don't think I've ever seen the playing area at the Roberts Studio look so vast. Director David Connolly has a big cast to work with and they need a lot of room, whether in the opening number that introduces the entire company, or in the bouncy production turn "The Toledo Surprise" (above). The show scores a happy 9.5 rather than a fully polished 10 due to a couple of minor points, some of which may smooth out as the run proceeds. When Man In Chair is alone on stage, the lighting is too murky. It's a distraction that interrupts the proceedings. Connolly is also letting a couple of the jokes get away at less than full potential. One in particular references "Miss Saigon" with a zing that should rank as one of the show's biggest rolling laughs. At the performance I attended, it was ignored altogether. Minor, but a show this good with a cast this bright deserves to glisten from start to finish. 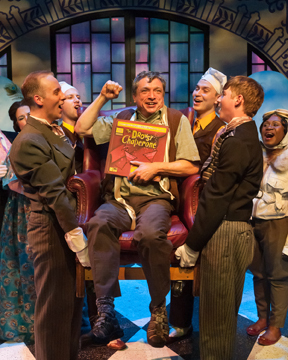 The biggest challenge with "The Drowsy Chaperone" is getting the public to understand how really sharp and funny it is. The title tells you almost nothing about what's in store. In fact, it kind of leads you in the wrong direction to believe the whole thing is a quaint, lacy-edged, old-fashioned show from decades past. As a side note, the show was originally a short spoof written as a private gift to a couple of theater people who were getting married (one of whom was book writer Bob Martin). At that time, there was no Man In Chair character. It was such a hit that it was expanded, adding Man as a narrator, and entered into the 1999 Toronto Fringe Festival. From there, it was further developed in a series of progressively larger productions. When the show played on Broadway (with seven Tony Award nominations) and on it's national tour, the television commercials never did it justice because there's almost no way to fully convey the jewel that it is in just 30 seconds. Which is why word-of-mouth has always been so important in building an audience for this show. Truth be told, when I originally saw the show in New York, it was on a Sunday afternoon when everything else I wanted to see was sold out. I bought a deeply discounted ticket 30 minutes before curtain for the matinee. The surprise was that I was completely won over in the first five minutes. And by the time I walked out of the Marriott Marquis Theatre two hours later, I couldn't believe how close I'd come to NOT see something so sharp and entertaining. As Man In Chair explains, musicals are supposed to help you escape from the horrors of the real world. If only for a few hours. 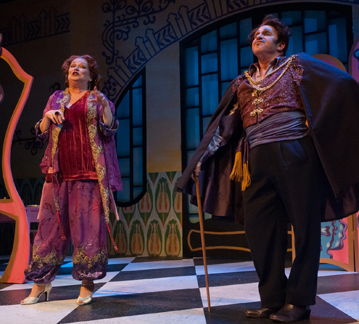 Therefore -- if you're a fan of musicals, if you love clever shows, and if you appreciate sharp performances, get yourself to the Calderwood Pavilion to see "The Drowsy Chaperone." Then tell a friend. 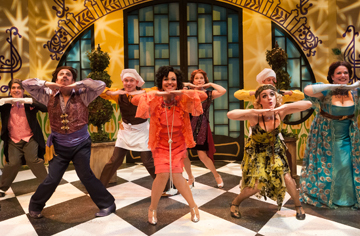 "The Drowsy Chaperone" from SpeakEasy Stage is at Calderwood Pavilion through June 6. For information, call 617-933-8600.